UK: E.on's 219MW Humber Gateway has exported its first power to the UK grid as cable installation is completed at the site. Power was first transmitted to the mainland last week and the project now has 58 of the 85 MHI-Vestas 3MW turbines installed. 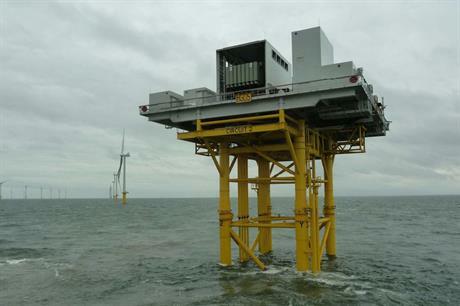 Humber Gateway is located in the North Sea, eight kilometers off the coast of northeast England. The project's substation was put in to place at the end of October, while ESS handled the inter array cables and ABB supplied the export cables, installed by VBMS (formerly VSMC). Services provider 3Sun was handed a contract by MHI Vestas tosupport electrical and mechanical completion of the Humber Gateway turbines. The firm will provide technicians to help complete the installation. Humber Gateway project manager Matthew Swanwick said the project was progressing on schedule, despite "spells of bad weather". Installation of the turbine is expected to be completed "over the coming months," he added. E.on also launched a £2 million (€2.7 million) fund to benefit the communities near to the Humber Gateway project.